FANBOY PLANET.com . : mc-banzaivitale022304 :. On any film involving action, your stuntwork is only as good as your coordinator. In past interviews with Scott Zakarin, he has stressed how lucky he felt to have found Banzai Vitale to fill that role. 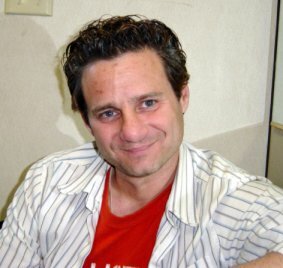 A veteran of several favorite genre shows (including doing the stuntwork for Danny Strong on Buffy) and films, Vitale has been working in the business for longer than he wants to admit. We sat down in his trailer, temporarily kicking out his stunt team, to talk about his work on Jekyll and how it compares to his other experiences. Derek McCaw: I'm guessing your parents didn't name you Banzai. Banzai Vitale: No, they didn't, actually. My best friend growing up, he used to say "quit banzai-ing around…quit banzai-ing around." I came from a really small town, so by the time I graduated high school, that's all I'd gone by. It became my official name. DM: How'd you get involved with Creative Light? BV: Steven Fogel, one of the producers. I'd been in an acting class with him for a few years. He got me an interview with Eric (Mittleman) and Scott came in, we talked, and I walked out the door with the job. DM: Is this your first time as stunt co-ordinator? BV: Oh, no. I've been in the business for years. Since 1985…that's like twenty years. No, I'm not that old. (smiles) Can I say 1995 instead? Recently I've worked on The Rundown with The Rock. I had an acting and stunt role in Dude, Where's My Car? and The One with Jet Li. A lot of TV shows like Angel, Buffy, CSI and JAG. That sort of thing. DM: Have there been any particular challenges to working on Jekyll? BV: It's been great. The biggest challenge is that this is a low-budget movie. Out of the fifteen days of shooting, nine of those days have stunts. It's quite an endeavor. The real challenge is developing the fight style for Jekyll and Hyde. What we wanted to do was develop a specific style. For this movie we wanted the stunts to support Scott's vision. In other words, in the beginning Hyde's fight characteristics are very animalistic but also very graceful. Jekyll's in control of his character at the beginning. The fights are very brutal, very quick and very efficient. But also very graceful. As the movie progresses, he loses more and more control. Hyde takes over more and more. We use less graceful moves until the end of the movie where there's just no grace left - it's just a pure animalistic brutal fight. DM: Since Hyde starts out as essentially a videogame character, how much did the gaming world influence your thinking on his style? BV: I never let that play into the style. It was more important to Scott, Matt (Keeslar), Eric and myself that we sit down and really talk about the character. We all agreed that with the amount of stunts that are in this movie, it isn't about "ooh…this would be a cool place to put a stunt. Let's put one here." The stunts were not put in unless they helped tell the story. And a videogame style is a very unrealistic sort of play. We wanted to keep it real. What could happen in real life? Hyde doesn't have super-human strength or anything like that. He's just hopped up on adrenaline, and we use that style. A videogame is much more Hong Kong style, more fantasy, so we couldn't use it. DM: Do you have a regular team for your stuntwork? Scott Zakarin will let no one do a stunt he's not willing to do himself. 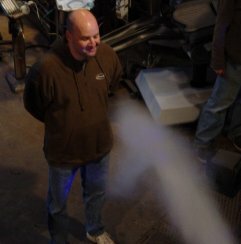 As long as it involves foam. BV: I have a core group of about twenty to thirty people that I know really well. A lot of them I trained myself. So I know what each one's abilities and limits are, and I try to use those guys over and over, because I know I'm going to get exactly what I need. When I bring in somebody I don't know, it's sort of a crapshoot. Usually I get what I want; it just works out better when I know I don't have to worry about what they can and can't do. For example, Rick Marcus is doing the stunt-doubling for Hyde. The character has to do a high fall, and I know that Rick is a good high-faller, so I know that I can incorporate that into the stuff. We work that all out in pre-production. So knowing all their skills helps me out during prep week. I can say, "here you go, Scott. We can do this and this and this. Uh, not really an acrobat, so we can't backflip…"
DM: You say you've trained a lot of your crew. So do you teach classes? BV: No, I don't teach classes. I'm the stunt director and casting director for the Batman and Robin live-action show at Six Flags. DM: Hey, then I know your work! DM: Is that just Six Flags Magic Mountain, or do you do all the parks? BV: It's just Magic Mountain. I've directed some of the other shows in other states, but my main deal is here. DM: Is the speed of this particular production posing a hazard? You yourself mentioned that the stuntwork is needed nine out of fifteen days, and things are moving pretty fast. BV: I'll tell you what. One of the best things about this shoot, and it rarely happens on a low-budget shoot like this, is that the producers, Scott, Eric, Peter and Steve, have been great about it. When I came in I said, we don't rush these things. We can't have people getting hurt. That's my condition for coming on board. I get all the time I need. I've been able to bring in people for a rehearsal day, to get everything blocked out. It costs a little more to bring them in, but the amount we save because everything's blocked, we know exactly what we're going to do when we come in for the shoot - it's bam, bam, bam, bam - we shoot. There's no snags, no surprises. We're not wasting time resetting up for this or that. This has been one of the best productions I have ever worked for as far as giving me the time to make sure that everybody's safe. If we have to take an extra fifteen minutes here or there, they're fine with it. DM: How does it compare to working on a weekly series like Angel? BV: It's sort of six of one, half a dozen of the other. Angel is quicker. But they have the money where they actually have no problem bringing people in and letting us rehearse, whatever. The biggest advantage to Angel is that crew. They've been together so long and know each other so well that they just fly. It is kind of a rush sometimes. Here we go, work out the fight, we're ready to shoot it. 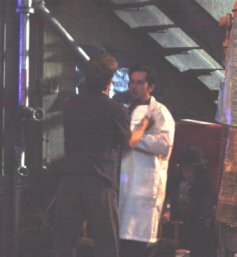 And the Jekyll production itself was flying that day, as Banzai was called out to oversee a fight between Matt Keeslar and Jonathan Silverman. 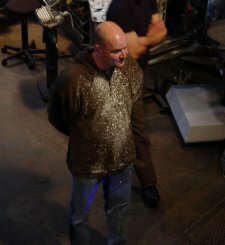 Stuntman Rick Marcus was grateful, because then he could come back into the trailer instead of hanging out in the parking lot dressed as Hyde.